Space is at a premium in most homes, especially in the kitchen. Therefore, sometimes you have to choose one appliance over another. One of those choices may be to have a toaster oven or microwave oven for the times when you don’t want to heat your full-size oven. We present the pros and cons of each to help you decide which is a better choice for your kitchen. Toaster ovens cook food using infrared radiation that is produced by coils with an electric current running through them. An individual oven may have one, two, or several coils. The heat generated by the coils warms the interior of the oven space and cooks the food from the outside in, producing a product that is cooked thoroughly on the inside and browned on the outside. Since a toaster oven’s coils heat food directly, this allows the cook to brown, caramelize, crisp, and toast foods, which are things a microwave cannot do. Each appliance has its limitations. Foods low in water content, like breads and low-fat meats, do not cook or heat well in a microwave and may be tough and chewy when heated. On the other hand, a toaster oven is not appropriate for thawing food or making popcorn. 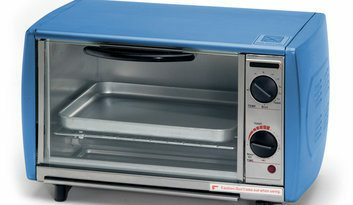 The direct heating of a toaster oven necessitates a longer cooking time since the heat must be high enough to cook the food but low enough to prevent the outside from burning before the inside is cooked. Because the level of heat can be adjusted, a toaster oven is also good for keeping cooked food warm at a low heat. This is something that a microwave cannot do. Microwaving is faster because the water molecules heat all at once in most foods, cooking the surrounding food very quickly. The rate depends on the wattage of the microwave oven. The higher the wattage, the faster the food cooks. Many toaster ovens and microwaves are countertop models that require no installation. Some, however, can be mounted within or under a cabinet. This type of installation is best left to a professional. Microwave ovens can be heavy and difficult to install. Installing a toaster oven under a cabinet is rarely recommended and requires specialized hardware to shield the cabinet from the heat of the toaster oven when in use. Installing a microwave oven over a stovetop is a popular way to save cabinet space, but it requires choosing the correct size to fit the width of the space and allow enough clearance under the microwave for access to the stovetop burners. Also, a stove exhaust fan must be included in the installation. Most building codes require a minimum spacing, so consult local ordinances before deciding on this type of installation. Toaster ovens are usually sized by the number of slices of bread they can toast at once. For example, a toaster oven may be classified as a four-slice or six-slice model. The typical footprint of a countertop toaster oven ranges from 16 inches wide by 8 inches deep to 20 inches wide by 10 inches deep. Microwave ovens, on the other hand, are sized by wattage and cubic feet. They range from 700 watts to 1,200 watts and 1.4 cubic feet to 2 cubic feet. The typical footprint of a microwave oven is 24 inches wide by 19 inches deep, making it the larger of the two appliances. A four-slice toaster oven can cost as low as $30 for a very basic model. A basic six-slice toaster will cost from $50 to $70. If the product is stainless steel and offers several specialized toasting features, however, the price will range from $80 to $150. Adding the convection feature for faster, lower temperature cooking will add approximately $100 to any size oven. As an example, a toaster oven with the hardware to install under a cabinet will cost about $140 for a four-slice size. Installation will cost approximately $155 for a total cost of $195. A countertop microwave will cost from $50 to $170 in sizes ranging from 700 watts to 1,200 watts. The price increases with wattage and cubic feet as well as features like a stainless steel finish and specialized cook settings. A built-in model will add approximately $300 to the price. Over-the-range models are about $50 to $100 more than the basic models. 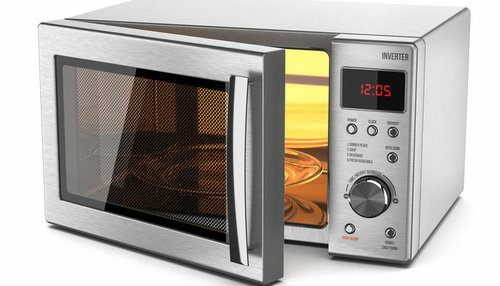 As an example, an 1,100-watt, 1.5-cubic-foot built-in style microwave oven will cost about $360. Installation will cost approximately $155 for a total cost of $515. Both appliances are recommended by EnergyStar as alternatives to the larger range/oven. However, the toaster oven uses slightly more energy than the microwave, about 1,200 to 1,800 watts. Using a cost of $0.12 per 1,000 watts per hour, the toaster oven costs about $0.15 to $0.22 per hour to operate. On the other hand, a microwave uses about 700 to 1,300 watts for cooking. Using the same cost, the microwave would cost about $0.08 to $0.16 per hour. Factor in the longer cooking times of the toaster oven, and it is easy to see that the microwave wins the energy efficiency battle. Maintaining either of these appliances is about keeping it clean. This is far easier with a microwave than with a toaster oven. A toaster oven has a wire rack, a crumb catcher, a glass door, and the heating elements that must be cleaned regularly and carefully. By contrast, a microwave is easy to clean with just soap, water, and a sponge or paper towel. Often, they have removable glass trays that can be washed in the sink or dishwasher. Toaster ovens have the same safety concerns as a full-size oven, which is the need to protect against burns and using flammable materials. It is also important to ensure that nothing is on or touching the toaster oven while it is cooking. The outside can become quite hot to the touch. While much has been said about microwave oven safety in the past, they are in fact safe as long as the manufacturer’s door is still intact. A damaged door means that radiation could escape when used. The oven should not be used unless a radiation check is done first or the door is repaired by a reputable appliance repair facility. One other note of warning: do not microwave styrofoam. Dangerous chemicals can leach out of styrofoam when it melts, as it might in a microwave. As with all electrical appliances, guard against damaged cords and contact with water. How much does it cost to install a toaster oven or a microwave in my city? Cost to install a toaster oven or a microwave varies greatly by region (and even by zip code). To get free estimates from local contractors, please indicate yours.